There are many things which you must decide before painting your truck. The most important thing is how much money you are looking to spend. You should decide how nice your truck should look as that will determine the quality of paint required. Make sure about the paint scheme and exact color. Before paining your truck, don’t forget to gather all the important parts such as sand paper, repair panels etc. Lastly, it is recommended that don’t buy the paint until and unless you start painting your truck. 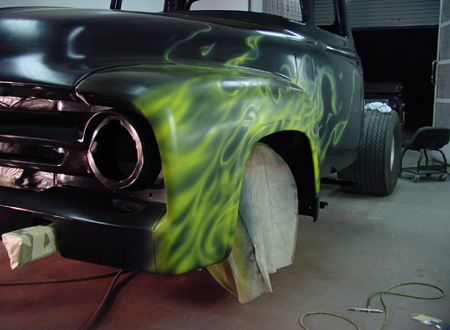 Make a list of the things which you require for painting your truck. Some of the important things are air compressor, sander, paint/spray gun, strainers, stir sticks, water remover filter, gloves, face mask, sanding block, primer, catalyst, paint, enamel reducer, hardener, clear urethane, sand paper, bondo, masking paper, tack cloth, rags, plastic, wax remover, grease remover, thinner and fans. Don’t forget to remove all the parts of your truck which can be removed before painting. Such parts may include chrome, windshield wipers and bumpers of your truck. After removing these, prepare the body. This means remove all possible rust and existing paint on the vehicle. It is very important that you remove all chrome, emblems, trim and door handles before painting. You can use a very high-grade automotive stripper like the Aircraft remover as it is very strong. Preferably use a long handle razor blade scraper and a long hair brush. After stripping in sections, neutralize the remaining with the help of soap and water. You should dry it with 80 grit sand paper making it clean and shiny. While doing the body work, use a 16inch file board to sand filler on flat panels. You can also use a 36 grit file board paper to heavy filler cutting it close. You should constantly use more filler to make it smoother. After this step, use an epoxy or lacquer primer. You can use 320grit dry sandpaper while sanding for paint. Now, after doing all these, wash the body of your truck with soap and water, leaving it to dry. Take special care so to ensure the body of your truck is dust free. Don’t forget to wash the floor and dry off the excess water. Before painting, test he spray gun on any sort of paper. Take note of the paint pattern before starting. While painting the primer, spray a small light coat of the primer on the body. Always hold the spray gun a minimum of 16 inches away from the truck. Start painting from the left, then slowly move and press the spray button. After the primer dries in 15 minutes, add three more coats. Finally during painting time, mix the paint thoroughly before opening the can. Try to lay the paint at nearly 55psi. You should mix 16 parts of the paint with 12 parts of reducer and one part of hardener. Use your gloves and mask while painting. It is recommended that you lay at least three coats of paint and each coat should be left to dry for 30 minutes before the next coat is applied. After completing the painting process, clean the can and gun. Close all cans and dispose any unused hardener, paint in a proper place. And leave the paint on your truck to dry over night and lay an optional coat, if necessary on the next day. If you would like to learn how to paint a car, visit iknewit.org.